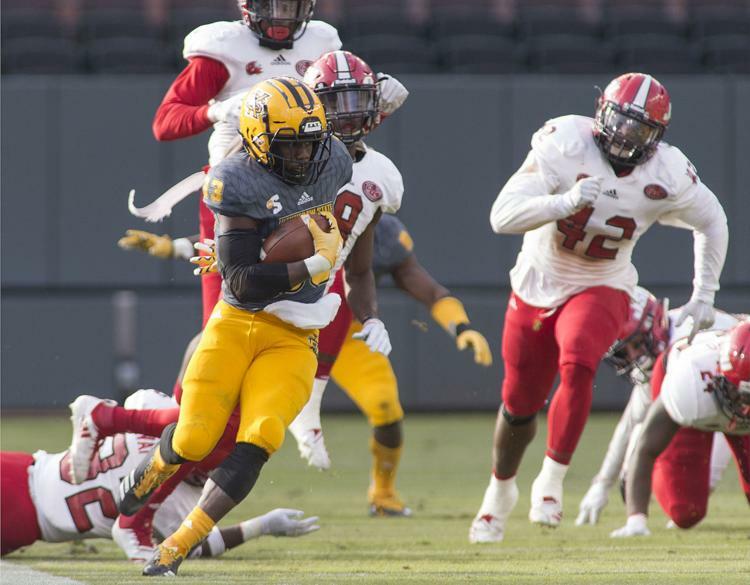 Kennesaw State clenched a monumental win on Saturday, as the Owls worked their way to five overtimes to bolster a 60-52 win over rival Jacksonville State at the Atlanta Braves’ very own SunTrust Park. The Owls, who clenched the Big South title the week before and entered the game ranked second in the FCS Top 25, had a slow start as the Gamecocks took a 7-0 lead with 6:29 left in the first quarter. Kennesaw still had trouble connecting with the end zone early in the second, but Jacksonville used that to its advantage to sweep momentum into its next touchdown run, putting them ahead 14-0. T.J. Reed woke the Owls up on offense when he scored a 21-yard rushing touchdown with 6:30 left in the second. Kennesaw would add a Justin Thompson field goal later in the quarter to make the score 14-10 going into halftime. With strong rushing performances from Darnell Holland, Reed, and Chandler Burks to open the third quarter, the Owls were able to make it up the field and allow Burks to connect with Xavier Harper for a 15-yard touchdown pass, giving Kennesaw its first lead of the night. The Gamecocks struck back with a Cade Stinnett 29-yard field goal, and a Zerrick Cooper 43-yard touchdown pass to Jamari Hester, putting Jacksonville up 24-17. The Owls made it their mission to pull out a significant comeback, and they did just that. With just 1:25 left in the game, Chandler Burks found the end zone off a 1-yard touchdown run, which after a Thompson extra point sent both teams into a record-breaking overtime marathon. Kennesaw maintained the first possession, and Darnell Holland took advantage of the Owls getting the ball first as he turned on his wheels to score a 20-yard touchdown. Jacksonville answered back with a Leander Burrows 2-yard run, which sent both teams into their second overtime 31-31. The Gamecocks opened the second overtime with a Josh Pearson 34-yard pass to Cooper, but that wasn’t enough to keep quarterback Chandler Burks from securing a 6-yard touchdown run and tying the game 38-38, which continued the overtime marathon into a third period. Even after Burks started the third overtime with a 25-yard pass to Reed, the Owls failed to nab the two-point conversion, leaving it all up to Jacksonville to pull out the win. After Burrows found the end zone off a 3-yard touchdown run, the Gamecocks failed to complete the 2-point conversion. After a 25-yard touchdown pass from Hester to Cooper to start off the fourth overtime, the Gamecocks failed to come up with the extra two points again, giving Kennesaw the opportunity they needed to take home the victory. Burks relied on his impressive run game and ran right through defenders to score a 1-yard touchdown to eventually tie the game 52-52, but the two-point conversion failed, which would push the game into a fifth overtime. The Owls stole the spotlight as Holland opened it up with a 13-yard touchdown run. 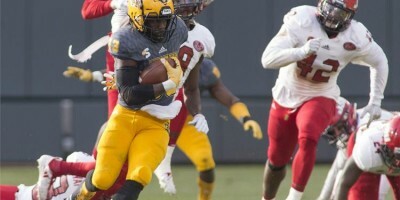 Kennesaw then found success with the two-point conversion after Burks connected with Justin Sumpter, pulling them ahead by eight. Jacksonville had one last chance to score and make the extra points, but all that was halted by last year’s Jerry Rice Award recipient Bryson Armstrong who intercepted Hester’s pass in the end zone. The feeling of a comeback win at SunTrust Park was immense for the Owls and their fans, who all came together to celebrate at the wall of the center field fence.